PRESENTA LA FESTA DI CAPODANNO A TRIESTE INSIEME A "UEPPA" (STEFANO CEINER SPEAKER AI GIOCHI OLIMPICI DI TORINO). MADRINA DELLA SERATA MUSICHE E PAROLE, GIORNATA EUROPEA DELLA CULTURA EBRAICA, CONCERTO THE IDAN RAICHEL PROJECT. PRESENTA L'ATTIVITA' DELLA FONDAZIONE ISRAELIANA "SIMCHA LAYELED / LA GIOIA DEL BAMBINO" CHE ASSISTE BAMBINI AFFETTI DA GRAVI MALATTIE O VITTIME DI ATTENTATI, SENZA DISTINZIONE DI RELIGIONE O NAZIONALITA'. CONDUCE IL GRANDE CONCERTO DI CAPODANNO A SALERNO CON LA PARTECIPAZIONE DEGLI STADIO, DEGLI ZERO ASSOLUTO, DI SILVIA MEZZANOTTE. MADRINA AL CARNEVALE DI CENTO. PROTAGONISTA ASSIEME A MARGHERITA HACK, PINO ROVEREDO, ARIELLA REGGIO NELLO SPETTACOLO MICI-AMICI A FAVORE DELLA ON-LUS IL GATTILE DI GIORGIO COCIANI DI TRIESTE. MADRINA ALLE FINAL EIGHT DI COPPA ITALIA DI BASKET ORGANIZZATE DAL GRUPPO SABATINI A CASALECCHIO DI RENO. VARIE PARTECIPAZIONI IN QUALITA’ DI OSPITE ALLA TRASMISSIONE RAI ITALIA SUL DUE. PARTECIPAZIONE ALLA GRANDE FESTA A ROMA, PER IL NOVANTESIMO COMPLEANNO DI ENZO MIRIGLIANI, PATRON DI MISS ITALIA. PROTAGONISTA DELLA CAMPAGNA FOTOGRAFICA DEL MARCHIO DI ABBIGLIAMENTO CASUAL BORA NERA DI FABRIZIO ZAROTTI. RICONOSCIMENTO DEL DIPLOMA AD HONOREM RILASCIATO DALLA SOCIETA’ MEDICA ITALIANA DI PSCICOTERAPIA ED IPNOSI, PER L'ELEGANZA DELLA COMUNICAZIONE. 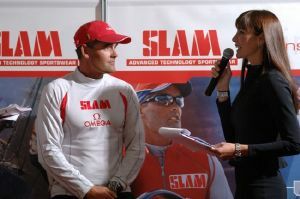 CONDUCE EVENTO SLAM CON LA PARTECIPAZIONE DI RUSSELL COUTTS, NEVILLE CRICHTON NELL’AMBITO DELLE MANIFESTAZIONI COLLEGATE ALLA REGATA VELICA INTERNAZIONALE BARCOLANA. MADRINA E CONDUTTRICE ALLA CERIMONIA DI APERTURA DELLA MANIFESTAZIONE REGIONALE XII FRIULI DOC. TESTIMONIAL PER MARCHIO PARAH COSTUMI DA BAGNO A PIETRALIGURE. CONDUCE LE FINALI REGIONALI DEL CONCORSO MISS ITALIA 2006. CONDUCE LE MANIFESTAZIONI SPORTIVE TORNEO INTERNAZIONALE GIOVANILE “CITTA’ DI GRADISCA”- 21 MEMORIAL NEREO ROCCO - 3 TROFEO EUROPA UNITA. TESTIMONIAL PER LA CAMPAGNA NAZIONALE CONTRO L' ABBONDONO DEGLI ANIMALI. PARTECIPA IN VESTE DI CONDUTTRICE E TESTIMONIAL ALLA BORSA INTERNAZIONALE DEL TURISMO (BIT) A MILANO RAPPRESENTANDO LA REGIONE FRIULI VENEZIA GIULIA. CONDUCE LA SERATA FINALE DEL FESTIVAL DELLA CANZONE TRIESTINA AL POLITEAMA ROSSETTI. TESTIMONIAL CAMPAGNA PUBBLICITARIA PRODOTTI COSMETICI BOTANIKA, COSTUMI PARAH, PARCO DI DIVERTIMENTO GARDALAND. CONDUCE IL TOUR 105 IN ALTA QUOTA CON RADIO 105 ED INGDIRECT CONTO ARANCIO. PARTECIPA IN QUALITA' DI OSPITE A DIVERSE TRASMISSIONI TELEVISIVE QUALI QUELLI CHE IL CALCIO, LA VITA IN DIRETTA, VERISSIMO, ETC. CONDUCE IL FESTIVAL DEL GARDA E IL FESTIVAL DELLA SARDEGNA. CONDUCE IL FESTIVAL CANORO CANTALAGO. COLLABORA CON GLI ATTORI COMICI NERI MARCORE' E GIANNI FANTONI, ALLA CONDUZIONE DEGLI SPETTACOLI NEL TOUR MEDIOLANUM 2000 - TUTTI IN UNA NOTTE. E' TESTIMONIAL DEL CONCORSO CON WIND VINCI IN PARTENZA. CONDUCE CON PIPPO BAUDO, ALLA MOSTRA D' OLTREMARE DI NAPOLI, TUTTI SPOSI. SFILA E POSA PER VARI STILISTI ITALIANI QUALI ARMANI, VERSACE, FERRE', BURANI ED E' MADRINA DELLO SPOT PROFUMO DI VERSACE. LAVORA PER ALCUNI ANNI COME MODELLA NEGLI STATI UNITI (LOS ANGELES, NEW YORK, MIAMI) ED IN AUSTRALIA. RITORNA IN ITALIA E PROMUOVE LA CAMPAGNA CONTRO L' ANORESSIA INSIEME AI PIU' PRESTIGIOSI STILISTI ITALIANI. PARTECIPA A NUMEROSE CAMPAGNE PUBBLICITARIE DI KITOSNELL, ATKINSONS, PIERRE CARDINE , ETC. INVIATA PER LA RAI, ALL’ HYDE PARK DI LONDRA, PER IL MEGACONCERTO PRINCE'S TRUST. FOTOGRAFATA DA OLIVIERO TOSCANI E FABRIZIO FERRI PER DIVERSE CAMPAGNE PUBBLICITARIE. POSA PER IL FAMOSO FOTOGRAFO HELMUT NEWTON PER IL CALENDARIO DI MAX. PROTAGONISTA INSIEME AD EDOARDO BENNATO DEL VIDEO OK ITALIA PREMIATO ALLA FINALE DEL FESTIVALBAR QUALE MIGLIORE VIDEO MUSICALE DELL' ANNO. VIENE INGAGGIATA DALLA PRESTIGIOSA AGENZIA DI MODA FASHION MODEL DI MILANO. PARTECIPA QUALE RAPPRESENTANTE PER L' ITALIA, AL CONCORSO INTERNAZIONALE MISS UNIVERSO VINCENDO IL TITOLO DI MISS FOTOGENIA. DEBUTTA CON PHILIPPE LEROY NEL FILM BACIAMI STREGA DI L. TESSARI. INIZIA LA SUA ATTIVITA' VINCENDO A SALSOMAGGIORE IL CONCORSO DI MISS ITALIA, CON GRANDE SCALPORE, PER ESSERE STATA ELETTA A SOLI 15 ANNI E CON GIUDIZIO UNANIME (FATTO MAI RISCONTRATO IN PASSATO) DI TUTTA LA GIURIA PRESIEDUTA DA DINO RISI.